Today I am hosting day 19 of the 30 days of Gift Giving blog hop! I decided to get a head start on my Christmas gifts for my co-workers. This one is for my friend Valencia! These are super easy gifts that don't break the bank. I got the Acrylic picture frame at walmart. I used Cindy Lou for the initial. I also used my I-Rock to bling it up alittle. Thanks for checking out day 19! Make sure to check out day 20 tomorrow with Michelle at Scrappin with my Bug! This weeks challenge over at Fantabulous Cricut is ACHOO. Create a project that has something to do with being sick. I decided to make a couple get well soon cards. The tree on this card is cut from Cindy Lou. Thanks for looking! Make sure to check out Fantabulous Cricut for all the other DT projects! Welcome Everyone to day 7 of the 30 Days of Gift Making blog hop! I decided to make little gift boxes filled with M&M sticks for some of my friends for Christmas. This gift box is cut at 5 1/2 inches from Tags, Bags, Boxes and more. This tag is also cut from Tags Bags Boxes and More. The snowflakes are cut from Winter Woodlands. I used my new Tattered Angels Glimmer Mist on the snowflakes. Thanks for stoping by today! Make sure to check out Martha tomorrow for day 8! I have a SPECIAL PROJECT for you all! This is my first time making it and I am excited to share it with you! And here is a picture of the inside..
Cut two pieces of cardstock, one 3x10 and one 6 x 1 1/2. Punch a hole! I do not have an oval punch from SU so I used my window word punch to punch my hole. I used punched over and over again until my hole was big enough for the hand sanitizer to fit. Now you will attach your small cardstock to the bigger piece. Glue the bottom tabs of your small cardstock to your bigger piece as pictured below. After its secured to the bottom glue the sides to the back and the front of your holder. Here is what it looks like all glued together. I also added cardstock to the inside to make it alittle nicer then just plain cardstock. And now here is what it looks like with the hand sanitizer in it. To keep the hand sanitizer in place I put a small glue dot on the bottom. Now decorate the cover how ever you would like. I decided to cut a deer from Christmas Solutions. I also added tulle to the top to make it look alittle fancier. Thanks to everyone for visiting my blog and reading my tutorial and a special thanks to Holly for featuring me on her blog today!! 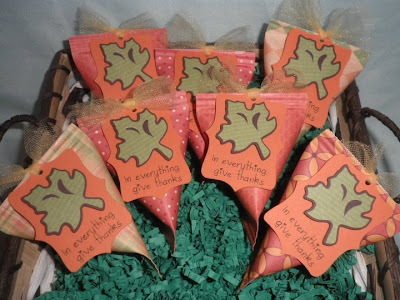 Here are some pictures of some Thanksgiving stuff I've been working on getting ready for craft fairs. My first one is on the 13th!! 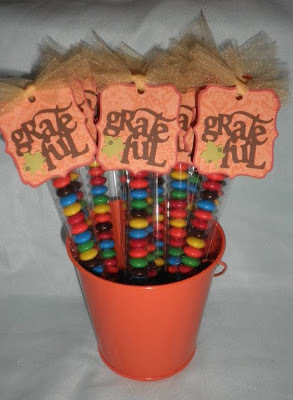 So far my most popular item... M&M Sticks. I get tons of questions asking me where I get my bags. They are from http://www.clearbags.com/ and they are 1x8 inches. The toppers are made from Gypsy Wanderings. Instead of ribbon at the top I tie them with Tulle. I like the look of tulle better. Sour Cream Containers! These are filled with hershey kisses. Again the toppers are make with Gypsy Wanderings and Stamping Solutions. Also the stamp is from Pink by Design stamps which can be purchased at http://www.pinkcricut.com/. 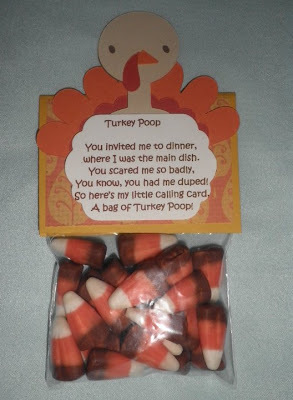 Turkey Poop! This turkey is cut from Create a Critter. Anyways, this weeks challenge over at Fantabulous Cricut is Birds! Create a project that incorporates a bird or something to do with birds. Here is my card! Make sure you check out the rest of the designers INCLUDING SOME NEW ONES over at Fantabulous Cricut!